Luo bo 蘿蔔 (萝卜) this can mean either daikon (mooli or oriental radish) or carrot. Shao 燒 in cooking terms can mean boil, bake, roast, braise or stew. It's confusing I know! 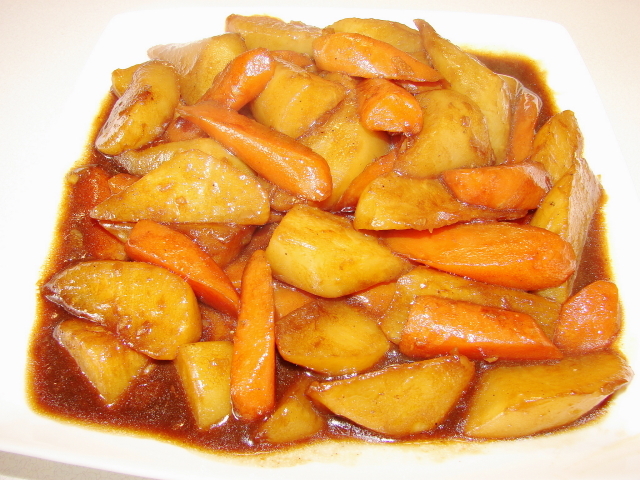 This braised mixed root vegetable is rather tasty. I can eat this happily and don't miss any meat at all. Peel daikon and carrot. Cut into chunks, rotate and cut vegetable into irregular triangular chunks called goon dao pian 滾刀片 in Chinese. Heat about 1/4 - 1/3cup of oil till moderately hot, add the vegetables. Stir at high heat, keep stirring till vegetables are slightly browned on the surface, about 10 minutes. Remove most of the oil and leave about 1 tbsp in the wok. Frying carrot and daikon does not absorb much oil at all. Using this much of oil is important to remove the strong mustardy smell and peppery taste of daikon. Push the vegetables to one side. Add garlic and ginger, stir till fragrant. Add dash of light soy and dark soy (for colour). Stir and add dash of wine and add about 1/2 - 3/4 cup of water. Stir and cook vegetables till tender. If liquid is drying fast before vegetables are tender add more water. Add some oyster sauce and a little sugar to taste. Thicken sauce with slackened cornflour. I just want to say i LOVE LOVE your blog. It teaches me chinese and to read the characters for food! Being chinese myself I always wonder if the stuff my parents conjure up is even considered chinese food. But reading your blog posts and seeing someone else cook the dishes just confirms it. Plus I love how i learn new dishes too. I just made this dish last night; it was excellent. Like Anonymous above, I really love your blog. It helps me learn Chinese cooking and the proper names and characters for food. I've been reading your blog for a while, and just haven't commented until now. A lot of your dishes have become my go-to foods, like the eggplant (*cough* aubergine in UK English) with Thai basil -- so much easier and less oil than 鱼香茄子. That's a nice dish..I must try it..thank you.